Here is a post I should have published last year as I read Uranium, by Tom Zoellner. Here is my review. It offers a detailed history of the discovery and the use of the 92nd element in the periodic table of the chemical elements. Will the 21st century be Uranium’s century like the 20th was oil’s and the 19th coal’s ? It is way to early to tell. The century is only ten years old and as oil and coal still account large parts of the world energy mix. Some speculate we will one day have thousands of reactors. Among them is John Ritch, the head of the World Nuclear Association who believes that within this century we would reach 8,000 reactors. This is to me completely out of question. This is even more preposterous as saying that the entire world could be powered only by renewables by 2020. Other energy sources are competing to replace the three hydrocarbons fossil fuels that are coal, oil and natural gas. Solar and wind power both have the ability to account one day for a fifth of the energy mix. Tidal and wave energy have lesser importance but still could fuel entire cities. Uranium itself is not dangerous. It has to be enriched to a certain degree and this requires colossal industrial installations. However, « A sphere the size of a grapefruit can eliminate a city », Introduction. The story of Uranium is detailed throughly from Martin Klaproth’s discovery of Uranium in Berlin (1789) to Enrico Fermi in Italy and the United States and the Manhattan Project that would create the A bomb and change the world for ever. Shinkolobwe’s reverses of Uranium – then Belgian Congo, today the Democratic Republic of Congo – was used in the Manhattan Project. More recent developments such as the mining in Australia are also presented. So far, no one ever used nuclear bombs. This is because of mutually assured destruction (MAD, what a nice acronym for such situation) and the equilibrium of terror. Among my criticism is that nothing is said about recycling the waste. The only relative topic is how we could keep future people away from our waste. Proliferation is an important topic and is luckily tackled notably with the Pakistanese and Israeli nuclear program. So for this, I am not giving it a perfect note. I appreciated reading this book but won’t give it more than 16 out of 20. Under the French grading system this is a good grade. 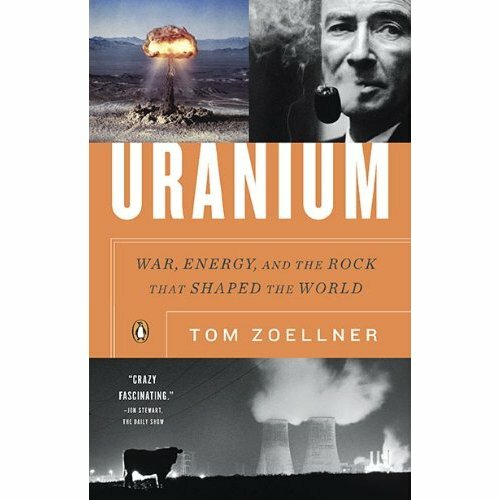 So if you are interested in knowing more closely uranium and don’t really care about learning a lot about the nuclear renaissance under way, read this book, it will give you some fantastic insight of what may well revolutionize our world again the way it did in 1945. Three decades of detoxication ? sleep therapy ? ah good, thanks for seeing the omission. I sure will keep up writing.